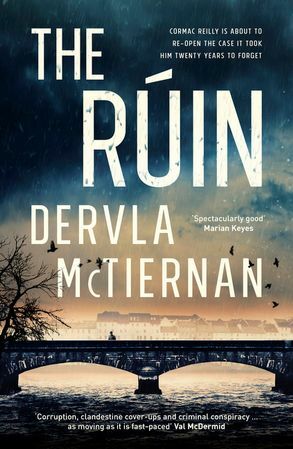 It has been another great year for Australian crime debuts and Derval McTiernan’s The Rùin continues this run. Much like Adrian McKinty, McTiernan sets her first Cormac Reilly novel in the old country, aka Ireland. But her take, while still procedural, is more contemporary and less overtly political. The book opens twenty years before the main action. Reilly, a fresh faced rookie policeman, is driving down a dark country road looking for the source of a call about a domestic. He does not expect what he finds – Maud, a self-possessed fifteen year old girl, her five year old brother Jack and their single mother, dead of a heroin overdose. Reilly takes the children to a local hospital where Maud disappears and Jack goes into the care system. Twenty years later, now detective Reilly moves back to Galway from Dublin where, for his sins, he is put on cold cases. After the apparent suicide of now twenty-five year old Jack and the reappearance of his sister Maud, Reilly is handed their mother’s cold case to reinvestigate. The narrative follows not only Reilly but Aishling, Jack’s pregnant girlfriend. Aishling believes the original theory that Jack may have committed suicide but is convinced by Maud that something is not right. McTiernan explores how Aishling moves through the stages of grief and how, when she starts to get her life back together, she could track down information that may have eluded the police. McTiernan manages to ramp up the personal pressure on both Reilly and Aishling as the revelations start to flow. Reilly has plenty of backstory, particularly his reasons for coming back to Galway, but all this is kept firmly in the background. McTiernan gives readers enough information to get the gist, and to understand why Reilly might be targeted by his colleagues, while leaving some secrets to be revealed in future instalments. At the same time, The Rùin addresses deep wounds in the Irish psyche. The history of child sexual abuse, the role of the church and the complicity of courts, social workers and police in the system, is explored in painful detail. Everyone, adults and children alike, is scarred and there is a recognition that there is some damage that cannot be undone while many of the perpetrators remain unpunished. The Rùin is a deftly written, page turning procedural. It is a strong start to a new Australian crime series (and there is no doubt that this will be a series – the first chapter of book two was tantalisingly included in my copy). If you are finding it hard to keep up with the number of new Australian crime writers coming onto the scene, McTiernan is definitely one to look out for.